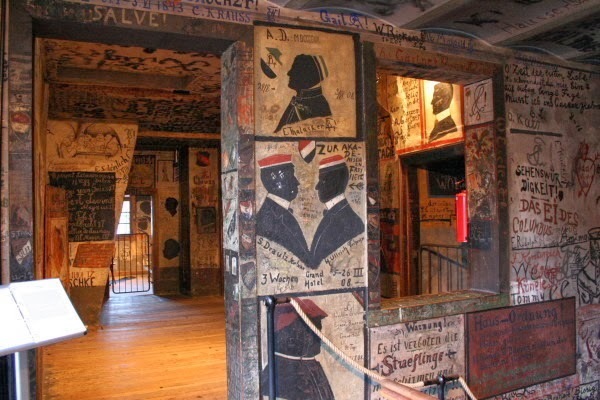 Sanguine et Purpure: Did Germany invent the "Frat House" 400 years ago? Did Germany invent the "Frat House" 400 years ago? A must see on your next visit to Heidelberg. Alas, no beer pong tables. Studentenkarzers, or private jail cells designated to punish students, were once the norm at many of Germany's schools of higher learning. But after the lock-ups became nothing more than party rooms, most of them were abandoned and some, such as the Heidelberg University Karzer, were permanently preserved. Established in the 1600s as a means of allowing students to police other students, the karzers were simple rooms where young academics would be sent for minor offenses such as drunken conduct, insulting authorities or staging a duel. The accused would be forced to lodge in the jail for anywhere from a few days to a few weeks, but was still allowed to attend classes and other primary academic functions. Over the years, being thrown into the karzer became a sort of rite of passage for the students, who would actively seek punishment. Eventually visitors were allowed and the jails devolved into party palaces, where the locked-up students would invite people over to celebrate their incarceration, marking the walls with graffiti, often from their respective fraternity houses. No longer in use, the Heidelberg karzer has been preserved in its original state, including iron frame beds and wooden tables decorated by the etched writings of former students. The walls too have been left perfectly alone, still covered in the centuries-old scrawl of proud delinquents.